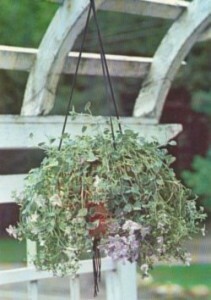 Hanging garden baskets are a hit almost no matter where you place them. They definitely add charm and country warmth to any location you place them in. Although there are so many types and varieties to choose from, I have always favored baskets that give a lot of bright color. Green is cool, but pinks, reds, violets, whites and blues go very far in helping to create just the right atmosphere around your home and in your garden. Green works and color works too. The enchantment of masses of small satiny flowers spilling over the sides of a hanging basket makes the Magic Flower one of the prettiest choices for a bright corner. This relative of the African Violet is bushy and beautiful, with silvery foliage and blossoms of soft pastel blue, deep pink, bright rose pink, deep purple, bright red, or pure clear yellow. 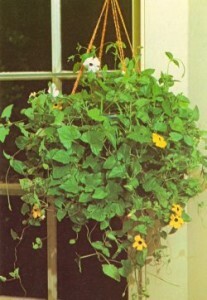 The spreading habit of the plant will have filling and overflowing you hanging basket in no time. Tough and robust, it will bloom all summer. After it flowers, let the plant die back and divide the rhizomes; give them a two-to-three month rest. In the spring, replant the rhizomes and water them again for blooms from spring till fall. Magic Flowers grows best with high light with outdoor temperature of approximately 65° to 80°F (18° to 27°C) and an average humidity of 25% or more. Can tolerate 50°F (10°C) without damage. Keep the potting mixture moist at all times, but not saturated. Special Notes: If tips and edges of leaves turn brown, raise the humidity if hanging indoors. Also, allow the potting mixture to dry and top growth to die when growth slows in fall. This cheerful little flower is also known as the Black-eyed Susan vine because of its sunny yellow five-petal flowers with deep a purple center. The flowers can range from white through buff to orange, but are most attractive in yellow and they usually are produced in summer and fall. The wiry stems are dressed in triangular, bright glossy green leaves which are attractive even when the plant is not in flower. This plant is native to tropical Africa, and grows better in partial shade than it does in full sunlight. 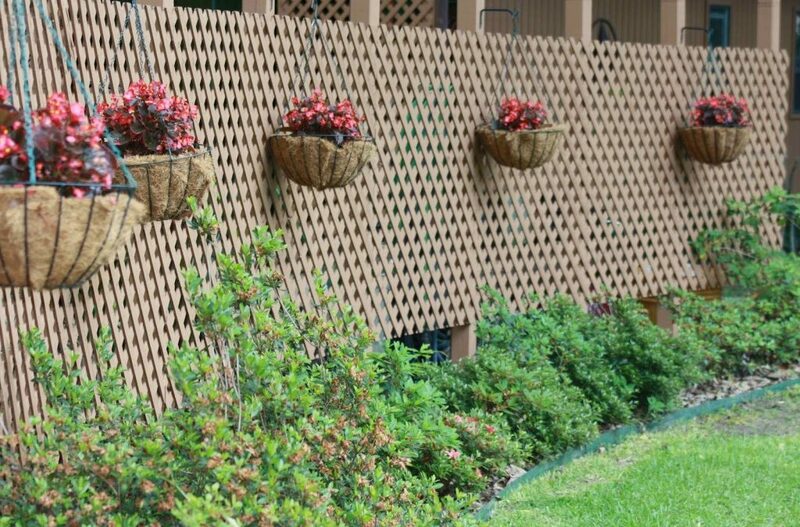 It will cascade to lengths of 3 to 4 feet, but also will act like a climber if you give it a trellis for support. The Clock Vine grows well in very high light or partial shade with outdoor temperature of approximately 65° to 80°F (18° to 27°C) and an average humidity of 25% or more. 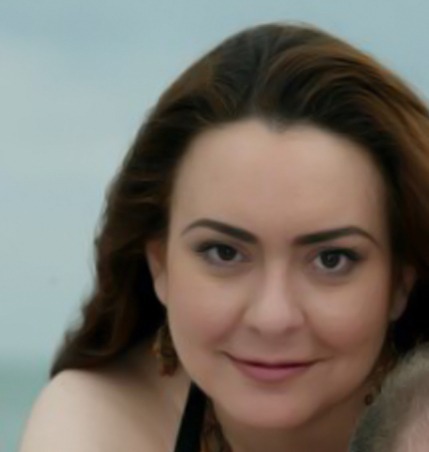 Can tolerate 45°F (7°C) without damage. Keep the potting mixture moist, but the plant can tolerate some surface drying without damage. 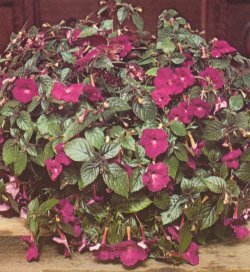 Special Notes: Cut back to 3 to 4 inches from potting mixture after heavy flowering to stimulate bushiness and flowering. If few or no flowers appear, move to higher light. Falling-Stars, Star of Bethlehem, Bellflower or by any of its pretty names, this is a charming little flowering plant. Originating in South Eastern Europe, this flower is a wonderful addition to a grouping of hanging baskets, with its dainty trailing stems with starlike, pale lavender-blue flowers gathered in masses. This is a summer-time plant, most likely to produce its flowers from midsummer to early fall. Pair it with one of its flowering relatives in a small hanging pot placed near a sunny window and you will be delighted by the fine-textured, colorful effect. Falling-Stars grow best with high to very high light with an outdoor temperature of approximately 50° to 70°F (10° to 21°C) and an average humidity of 25% or more. Can tolerate 35°F (2°C) without damage. Keep the potting mixture moist, but the plant can tolerate some surface drying without damage. Special Notes: If few or no flowers appear, move to higher light. Cut back to 6 to 8 inches from potting mixture during winter.